Whilst the major western European economies have been mired in economic stagnation since the onset of the financial crisis in 2008, economic growth across much of the African continent has been robust; the World Bank March 2014 Africa Overview indicated that during the period 1995 to 2013, the average annual GDP growth was 4.5%. If African national economies follow a similar pattern to the world’s leading developed economies then it can be expected as consumer spending rises consumers will spend an increasing proportion on leisure, and within that sport media products. It might be anticipated that this trend might be accentuated by the intense interest in sport, and particularly in football, across the African continent, and the associated interest in the successful playing careers of so many African players with leading European football clubs. 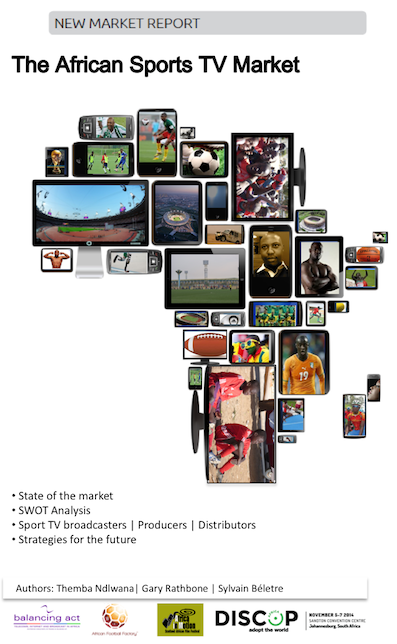 Africa is a new, complex and relatively untapped market for sports on TV. The sports’ programme segment in Africa is largely under-developed despite several paradoxes; the fact that Africa holds 1) a very strong sports audience, especially for football programmes (among a continent of 100 M. TV households), 2) a large number of TV channels and radio stations, 3) a pool of talented international sports’ players. The population of the African continent has access to a wide range of TV channels and to a growing number of DTT platforms, but it has a limited number of sports-dedicated channels and most of them need a pay TV subscription. The bulk of Sports TV programmes showing in Africa are a mix of African and European content together with content from the rest of the World. The production of home-grown sports programmes is very limited, not widely distributed and most of African sports programmes are not watched outside of Africa. However, there is a growing interest globally among broadcasters for quality sports TV content from Africa and for African football in particular. Sports and TV are symbiotic in Africa, as is the case across the global economy: major sporting events are one of the key means for TV channels to increase their audience (and subscriber base in the case of pay TV) and to generate large advertising revenues. Premium sports represent a small portion of all televised sports activity as measured by number of minutes shown; yet they capture the lion’s share of advertising revenue and viewer interest. Over the past 10 years, there has been a huge gap between unregulated, expensive sports’ premium content rights offers and what African TV buyers can afford. The African sports programme sector lacks transparency and is not regulated as is the case in Europe. Interviews with key content providers illustrated that African broadcast rights for international sports matches are usually much lower than in developed Western European and North American markets. African broadcasters also tend to have a limited knowledge of the supply side when it comes to acquiring sports rights and how much they cost. A large proportion of African TV broadcasters appear to have difficulties attracting sponsors for local or international sports programmes. Over the past 3 years the development of pay-tv in Africa has transformed the broadcasting of premium sports leagues. DStv, StarTimes, Zuku TV and Azam TV as well as new DTT platforms are currently increasing the competitive TV offering, putting pressure on programme acquisition managers to find content that will attract large audiences; sports programmes are therefore on the radar. Themba will conclude his analysis by presenting some possible scenarios for the development of the African sports tv marketplace. Mr. Themba Ndlwana is an African sports media consultant with particular experience in sports media rights and sponsorship sales. His passion and love for sport and its power for socio-economic development culminated in a career transformation. Having riginally graduated from City University. London, in Business Computing Systems, he returned to university where he completed a Masters in Sport Management at Birkbeck College, University of London. He then joined one of the leading pan-African sports media agency – Optima Sports Management International – where he gained a continent-wide perspective on sports rights sales and sponsorship sales. He is very optimistic about the development of a sustainable African sports economy and he feels that the media, especially TV, has a vitally important role in the expansion and viability of African sports institutions. He sees himself making a significant contribution towards the creation of a robust African sports infrastructure with a solid economic foundation.